Should Dunker Punks Play Politics? This definition gives us a firm foundation for each of us to root ourselves in, no matter what context we are currently living in. Having this rootedness is key. 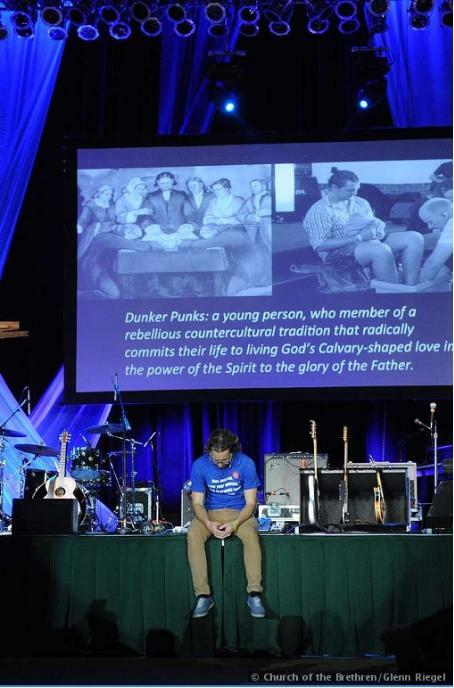 DunkerPunks must be individually and communally rooted in scripture, Brethren theology and traditions, and the immediate context and community surrounding each of us. It may sound fun to be countercultural or rebellious, but we can only be authentically and effectively countercultural if we spend time steeping ourselves in scripture and Brethren community. We have to figure out where we fit in to the larger story, so that we can faithfully contribute to the development of that story. If we fail to do that, our efforts will be in vain, or unintelligible, at best. When applying this to politics (in this instance, specifically immigration reform) we have to be sure we know why are faith is compelling us to enter the realm of politics. Because advocating for immigration reform (or many other political issues) can make sense on many levels (economic, humanitarian, etc. ), but why did over 100 religious leaders recently engage in nonviolent protest and get arrested because of their action? Because of faith convictions that have sharpened their moral understanding of how we are called to treat others. We have scripture instructing us to be kind to the sojourner, and most importantly we have Jesus modeling self-sacrificial love in his life, teachings, death, and resurrection. This ‘calvary-shaped love’ is what this whole movement hangs on. If we take it seriously, people take notice, and the world can actually change. When we apply this thinking to our original query, I think the answer is quite clear that yes we can get involved with politics (just as we can get involved with many other pursuits outside of the traditional church), but we must be deeply rooted in our tradition so that we can innovate with integrity and act faithfully. How do you think DunkerPunks can innovate with integrity? What Brethren traditions have the potential to be reimagined for transformative purposes? Leave us some comments below about your ideas! Keep up on all things DunkerPunks! Remember, DunkerPunks travel in a pack, so don’t forget to find a small group of 2 or 3 others to start praying, studying and thinking together about how God can use you in the Mustard Seed Revolution! ALSO: If you have the gift of design, we want you to design the Dunker Punks logo! Check out this DunkerPunk video! The youth group held a carwash to fundraise for National Youth Conference. Each is excited to join a multitude of Church of the Brethren youth at NYC. Five years ago, Daniel D’Oleo and Dava Hensley met over a shared vision. As Church of the Brethren pastors (one of a new Spanish-speaking congregation, the other of an established “Anglo” one) they had decided to share a building. They discussed the practical details about shared space, utilities, and timing of events, and trusted that the Spirit would move in their midst. But neither could foresee how deeply Roanoke First Church of the Brethren and Roanoke Renacer would unite in their shared space. They certainly couldn’t have imagined how it would impact their youth. Just over a year ago, the two youth groups decided to merge into one, big, multicultural crowd. The youth quickly bonded, and the groups became woven together into an inseparable mix. What started as a practical consideration of resources was revealed to be the Spirit of God blessing a vibrant gathering of young people. There was just one problem: Roanoke First Church of the Brethren had been raising and saving money to send “their” youth to National Youth Conference since 2010, but the new, combined group was much larger than they had planned. Roanoke Renacer had not had as much time to plan for the conference, so they couldn’t send all the youth who came from that congregation. Separating the youth group was unthinkable, so the two congregations combined their resources and the youth began joint fundraising in earnest. Between carwashes and luncheons, camping en route to save money on the trip to Colorado, and scholarships from Congregational Life Ministries, they made their goal. All the youth from Roanoke Renacer and First Church of the Brethren, as one large group, are NYC-bound. For some, attending NYC will be a continuation of a faith and family tradition. For others, it will be the first time anyone from their family will have attended. Regardless of their history, each is excited to join a multitude of Church of the Brethren youth at National Youth Conference. And all are excited to do so together, as one, big, beautiful group, born of a shared vision, moved by the Spirit. National Youth Conference is July 19-24. Register at www.brethren.org/nyc . Photos by Kendra Johnson, Katie Cummings, and Ron Lubungo. An excerpt from a sermon by Christy Waltersdorff, based on Matthew 5:1-12. Somewhere along the way I started signing letters with the word, “Blessings.” It is a meaningful word that wishes all good things to whomever I am writing. It has the fragrance of grace—that promise of a gift undeserved. In Matthew’s Gospel we find a list of blessings in the Sermon on the Mount. But more than that, we find a call for action, a teaching that is counter-intuitive, counter-cultural, radical, subversive—just like Jesus, himself. It is not concerned with what is practical or possible, but calls us to turn the values of the world upside down. Matthew helps us to see that we can believe these impossible things because of what we know about Jesus and the God who sent him. God blesses us and asks us to bless others. One of my Sunday school teachers used to say that the best way to think of the Beatitudes is as “be-attitudes.” They are ways of being—nine blessings that speak the language of grace, proclaiming truth that is the opposite of truth as the world knows it. “You’re blessed when you can show people how to cooperate instead of compete or fight. That’s when you discover who you really are, and your place in God’s family” (The Message). In his hilltop sermon Jesus addressed those who were, right then, dealing with difficult and painful realities. “Blessed are you who are poor in spirit, at this very moment, for yours is the kingdom of heaven.” Not after you die, not two hundred years from now, but right now. That promise remains true today. God is with you no matter what happens. You are blessed right now, and you are never alone. God is a God who cares about the meek, the mourners, the peacemakers, those who suffer. And even as they assure us, the Beatitudes call us to live as the people God created us to be, right here and right now. They encourage us to bless each other as we have been blessed by God, as an act of grace. A blessing is a prayer. It is a gift from God. Blessed are you… Amen. Christy Waltersdorff is pastor of the York Center Church of the Brethren in Lombard, Ill., and a worship coordinator for National Youth Conference. For suggestions of ways to bless others, visit www.brethren.org/volunteer, www.brethren.org/pray , and www.brethren.org/give . Photos by Wendy McFadden and Bethany Clark. The doctors removed a small bone in the ball of my foot two weeks before Christmas. It was a scheduled, outpatient surgery, but knowing it was coming didn’t make the recovery any less frustrating. Being stuck at home for several weeks put an abrupt halt on my normal schedule and to-do list. But a few days before the celebration of Christ’s birth, I finally realized that I had been given the Christmas gift I’ve always said I wanted: time to simply sit and savor the season. It’s probably sad that I finally got my wish because I had no choice, but the fact remains that it was a very special time. I stayed still. I stared at the star on top of our tree and considered God’s leading. I wrapped myself in crocheted blankets and gave thanks for warmth. I watched my neighborhood get tucked in under a thick, white blanket, and praised God for forgiveness that covers sins with mercies white as snow. It was an “in between” time, a sacred space. In a similar way, January can be an “in between” time for all of us—Church of the Brethren denominational ministries included. We wrap up the loose ends of the past year and get ready to dive into all the exciting things coming up in the new one. National Youth Conference coordinators and the workcamp team stay late at the office for their long awaited registration kick-offs. The Annual Conference office assembles necessities for their site visit in Columbus. And church planters (who seem to have a gift for “in-between” time) get their things in order before the Church Planting Conference in May. This time before the gears get really moving can feel a little like being stuck at home with a broken foot. But if we frame it right, if we focus on the many wonderful things on the horizon, it takes on a feeling of holy preparation. Like the quiet calm of Christmas, this time can be a gift, sacred space, full of thanks and praise. As we prepare to dive into this New Year, may we spend our “in between” time watching carefully for God’s leading, full of gratitude, and freely giving as God has so freely given to us. For a list of ways that you can get involved in Church of the Brethren ministries in 2014, visitwww.brethren.org/events ,www.brethren.org/volunteer , andwww.brethren.org/give .